Big projects can be managed best when broken down into sections, individual tasks, and subtasks. 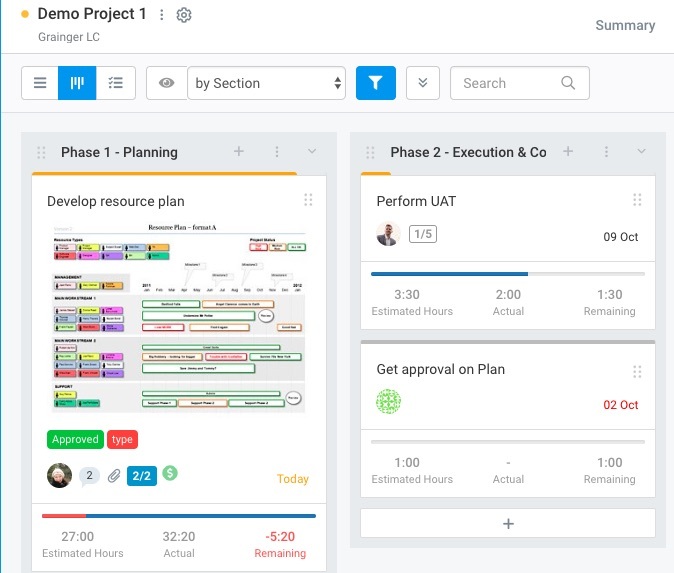 A new product launch, for instance, may have multiple project sections, that help you create a more efficient workflow for your project, with 30-40 individual tasks under each section that need to be completed, sometimes by different team members. 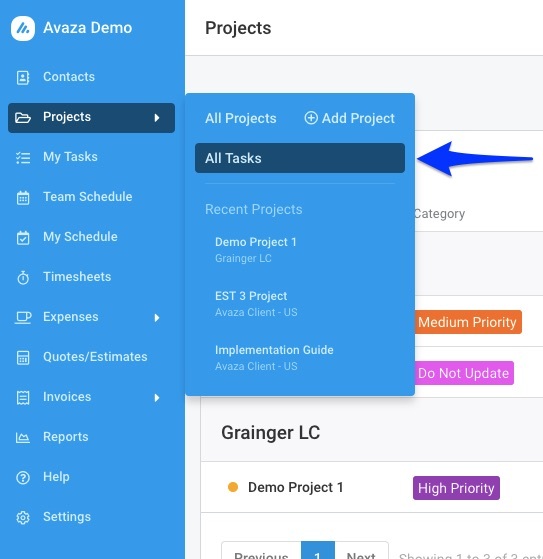 Avaza Tasks lets you create those tasks, assign due dates, keep all the files and notes in one place, and then track what’s been done or not while collaborating with your team. Large projects with 100s of tasks make it hard to find relevant tasks in a hurry. This can slow down projects and collaboration. Avaza has easy and powerful features for Grouping, Filtering, Tagging & Searching tasks. 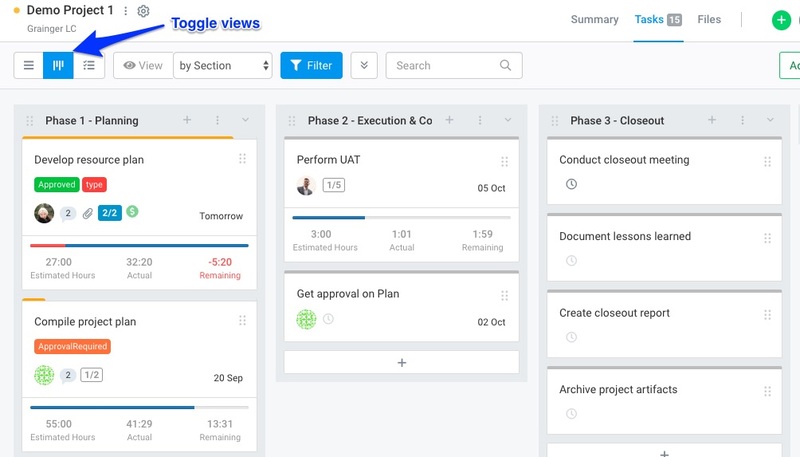 When viewing a project, or using the My Tasks view to see all your assigned tasks across projects, you can switch between a vertical list of tasks, a Kanban view that shows each group of tasks as a column or a Gantt Charts for establishing dependencies and auto-scheduling linked tasks. When there are a lot of tasks in a project, it helps to be able to break them down into useful groups. Tasks can be grouped by Section (default), Due Date, the person they are Assigned to and Status. In many of these grouped views, you can drag-drop tasks to update them. E.g, drag-drop to reassign the task when grouping by Assigned To. You can quickly filter the tasks that are currently displayed. You can filter by Assigned To, Task Tags, Start and Due Dates, and more depending on the screen you’re viewing tasks on. By default, you view only those tasks that are outstanding, but you can filter them based on any task status. Similarly, you can filter tasks by the person they are assigned to, due date or one or more tags. To view all tasks (not started, in progress and completed statuses), you can clear the Status filter or click ‘Clear Filters’. Tags let you organize and add context to your tasks. 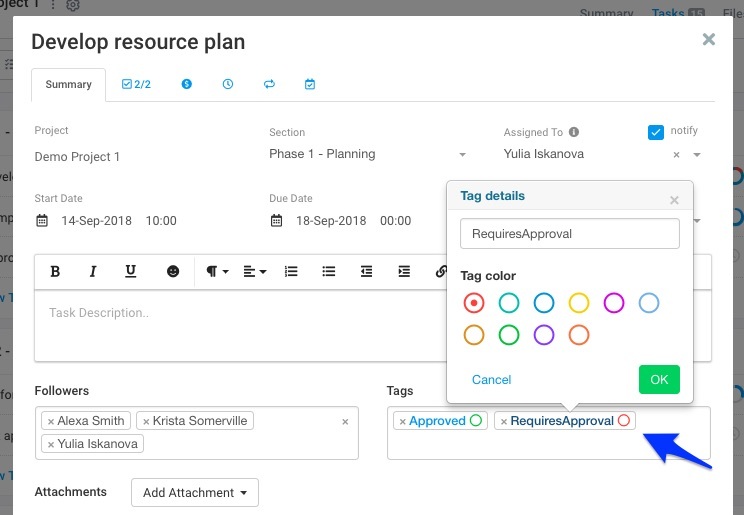 Team members will find it easier to track down relevant tasks using either the color-coded tags, or by using the Filter popup to find tasks with a certain tag. You can add multiple tags for the same task, and color-code them as needed. These are visible in List view as well as the Kanban view. Search through tasks by task title using the search box. This is the fastest way to find tasks with specific keywords. Task options, such as move, copy, or delete, are accessible via a 3-dot control. You can Move and Copy tasks from one section to another or even across projects when viewing tasks in Task List and Kanban views. To move an independent task, click on the 3-dot control to access the drop-down menu. You can also copy an entire Section’s tasks from one Project to another by clicking on the 3-dot control at the end of the corresponding Section. An alternative way to setup tasks is importing them in a CSV format. You can bulk-import tasks into your projects by navigating to Settings > Import data > Import tasks. For more information, refer to this guide. My Tasks is your central command. It shows you all tasks assigned to you (or another team member) across projects. Be more productive by viewing tasks assigned to you in one place without getting distracted by what the remainder of the team is up to. My Tasks can also be organized and filtered or grouped together just like the task list for each project. File attachments relevant to your projects are also accessed from here. You can also export all of your tasks that have due dates to an external calendar app using our iCal integration. You can quickly view tasks assigned to any one team member using My Tasks as well. Just click on your name at the top of the page, and choose the team member you want to view tasks assigned to. When viewing someone else’s tasks, you will only have access to the tasks that are under projects you are also a member of. View all tasks across your account (based on projects you are a member of) by going to Projects > All Tasks. The All Tasks view only shows tasks in list-view, and allows you to search, filter, and sort the list as required. By default, the list of tasks is sorted by the date they were last modified on in ascending order. You have multiple options to choose from to change the order in which tasks are displayed. The best tasks are comprehensive, providing those collaborating over it with all the details they need to get the job done in one place. Tasks need to be assigned to project sections. Sections are a convenient way of arranging tasks by stage/phase or custom workflow status within a project. Every business may have their own preferred workflow for projects, whether it is dividing projects into phases or another method, and each task you create has to go into one of these sections. You can assign the task to someone on your team to hold them accountable for its completion. 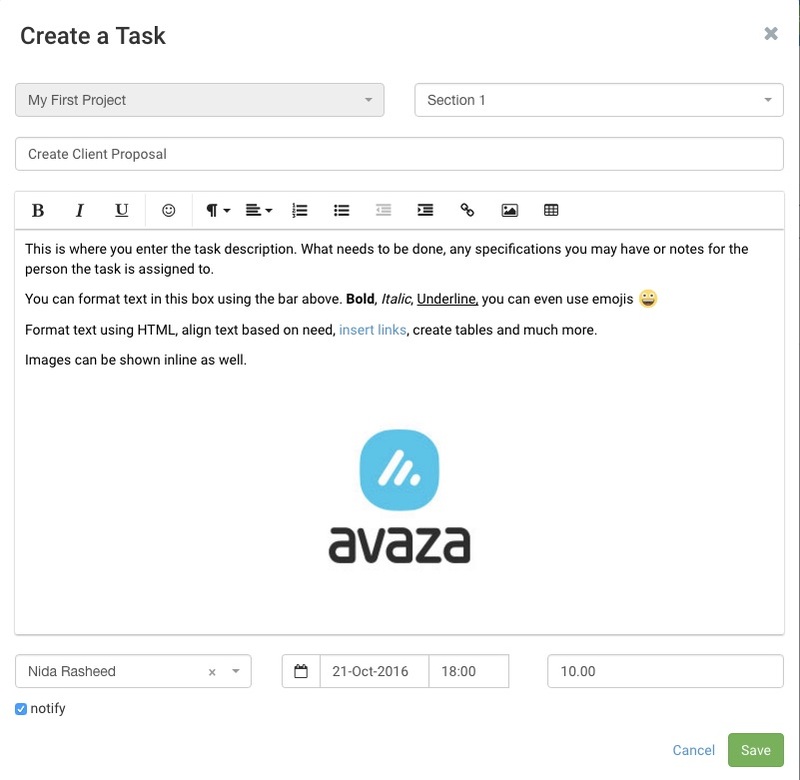 Avaza only allows you to assign tasks to one project member, but you can add followers if more people need to stay informed about comments on the task. When tasks are assigned to someone, you can choose to notify them by email. They can change the status of the task, collaborate with you on it, and mark it as complete once the work is finished. Each task begins with a task title. Enter a descriptive title that clearly conveys to the reader what that task pertains to. The more specific your task title can be, the easier it is for team members to understand how it fits into the overall project. Enter task-specific details into the rich text description box. These can include links to relevant URLs, inline images, bullets to break longer descriptions down, tables and much more. We even let you use emojis! Adding a start and due date to a task also provides team members with a deadline to finish the work by and helps prioritize the task list. Tasks that are due sooner will be shown above those that are due at a later date when sorted by Due Date, however, project managers can manually prioritize the task list using ‘drag & drop’ function in other task groupings (by Section, Status or Assigned To). Adding both start and due dates to the tasks will also allow you to add them to the Gantt timeline in order to visualize the project timeline and plan accordingly. By default, all tasks are set to start at 9:00 am and end at 6:00 pm, though you can override this and set custom start/end times as required. Tasks with start/end dates and time can also be synced with an external calendar of your choice using the iCal link at the project level or just for individual tasks on the My Tasks page. Learn more about syncing your tasks with an external calendar here. The Estimated Effort helps you define the target for the task in terms of the number of hours. This helps visualize how much time has actually been logged against the estimated hours in List view as well as the Kanban view. You can also run reports to compare estimated effort against actual hours across the entire project. While tasks can only be assigned to one person, they can have multiple followers to keep more team members in the loop. Followers receive notifications about new comments to the task and can collaborate on the task using email or the task popup. While they may not be responsible for completing the task, they can certainly make their voice heard. Documents, and images or other files, for each task, can easily be stored in the task itself. You can attach files from your computer, Dropbox or Google Drive. Team members can also email in attachments, or drag & drop screenshots into comments to provide context for their words. Every task follower will be able to keep track of all the attachments on a deliverable, which makes collaboration so much easier. Our File Management Guide goes into this in more detail. As mentioned earlier, team members can comment directly on a task itself, or email in comments by replying to task notifications. All users added as followers get notifications about comments via email as well, so everyone can be kept in the loop. 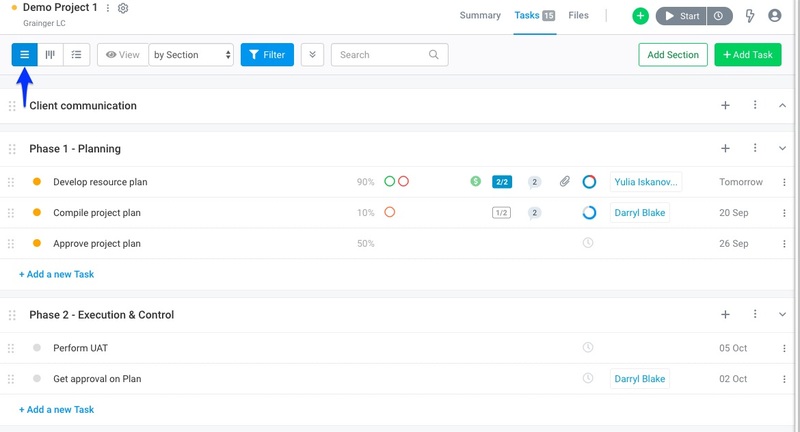 The Subtasks tab lets you create a list of all the smaller steps that are part of a larger task. You and your team can see the progress as you mark these subtasks complete. 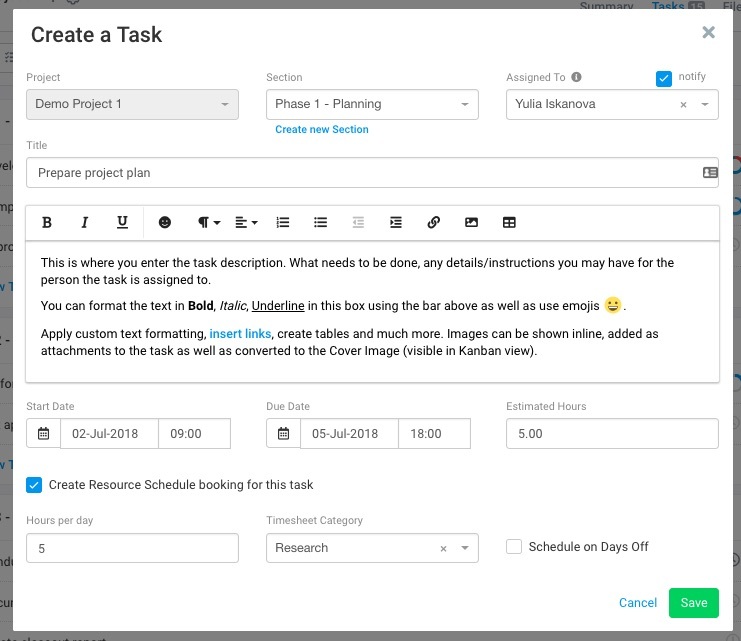 The number of Subtasks is also displayed via a subtasks icon in the main task view, so you can keep track of the number of completed versus total subtasks easily. The project email address allows you to collaborate using email. The Project email address is available via the 3-dot control next to the Project Title. You can add tasks, attachments and reply to comments by sending emails to this email address. When teams rely on email, or chat apps, to keep track of tasks on a project and collaborate on them, work gets slowed down because no one knows where any of the relevant files and comments are. 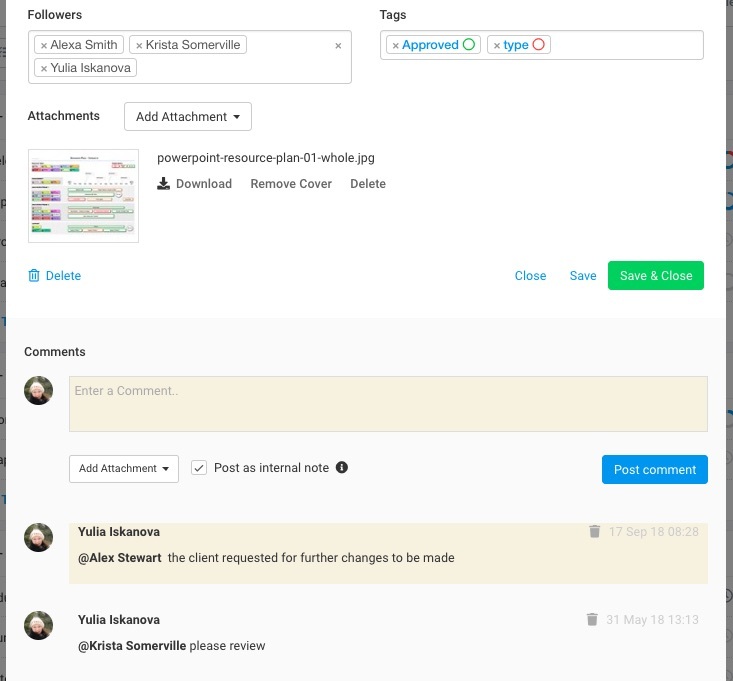 Figure: Tasks can be collaborated on by Followers, using Comments and Attachments. Avaza makes it easy for your team to collaborate across tasks. You can make decisions faster as all files, comments and information about each task are stored in the task itself. You can tag team members using @mentions to ensure no one misses out on an important task comment. This automatically generates an email notification for the @mentioned user as well as any users added to the task as a Follower. To tag a user in a comment, simply enter the @ symbol to display a list of project members. If a user is not visible in the @mention dropdown, please check that they were added to the project by going to the Project Settings page > Project Members. All project members must have the ‘Project Collaborator’ role assigned to them at the Contacts level. Team members can collaborate via the task popup, or choose to email in their comments, files or even new tasks they want to create. Work gets done so much faster when everyone knows where all the relevant files and notes on every task are stored – in Avaza! Do you need to bill based on time as well as fixed amount? The Fixed Amounts Payment tab allows you to invoice for work as it is completed. With this tab, you can add individual billable items to your tasks that can later be pulled into invoices. This can also be used for milestone payments. The Billable Fixed Amounts tab within the task pop-up is visible only to users with Project Manager or Admin permissions within the project. Project success depends on completing tasks as quickly and efficiently as possible. It is also important for project managers to be able to track how far each task is to being completed without having to ask each responsible team member to provide an update. Several features in Avaza Projects help you keep track of task progress using visual aids. Viewing a long list of tasks with no context for what’s in progress and what’s complete can be a stressful sight. Task status is a useful way to provide additional information on what’s happening with each task. All tasks start out as “Not Started”, but once they are marked “In Progress” they are color-coded orange to show they are being worked on currently. Tasks that are marked Complete are both removed from the default task list view (which only shows outstanding tasks) and are marked with the date they were completed on. This can help you run useful reports at a later date. It’s valuable to be able to quickly see the amount of time spent on tasks, and how that compares to your budgeted time estimate. 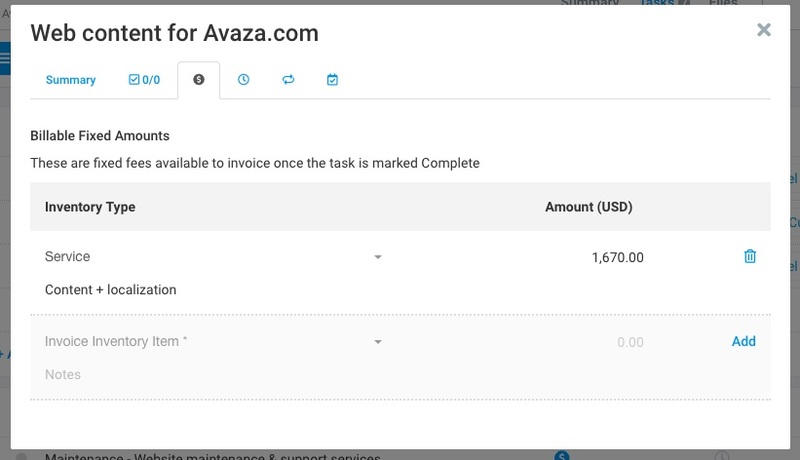 Avaza lets you add the estimated amount of time you think it should take to complete a task into the Task Time tab. 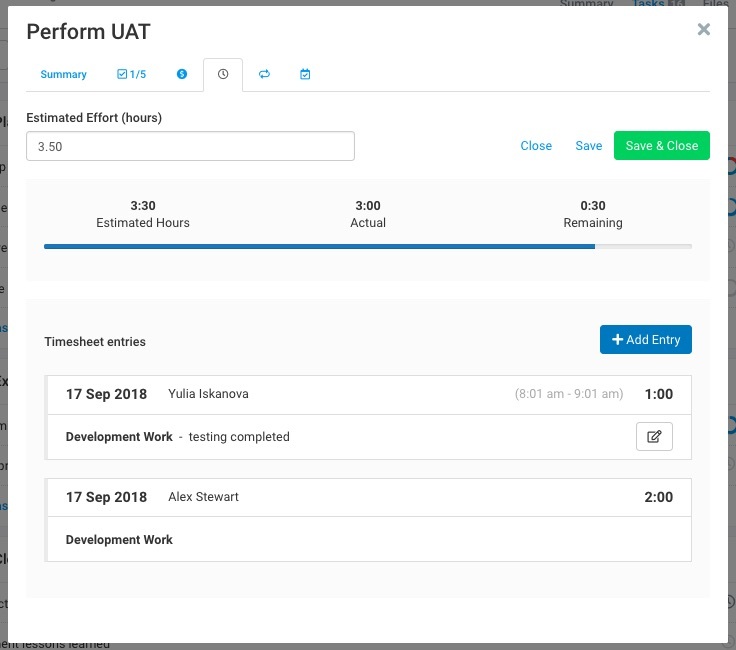 At any time you can view all Avaza timesheet entries created against that task as well as a progress bar that shows time estimated versus time spent. You can read more about this feature on our blog: Track Estimated Time vs Actual Time Spent on Tasks. When working with common tasks that need to be performed on a recurring basis, for example, weekly catchups, monthly status reports, checking in on your social media performance, annual contract reviews, etc., you can set up recurring tasks. To be able to easily differentiate the tasks created using the recurring task functionality, you can use smart tags, i.e. dynamic variables, that can be inserted in the task title or description in order to indicate the date on which the task was generated, for example. Please note, the recurring task functionality is not available on the free accounts. 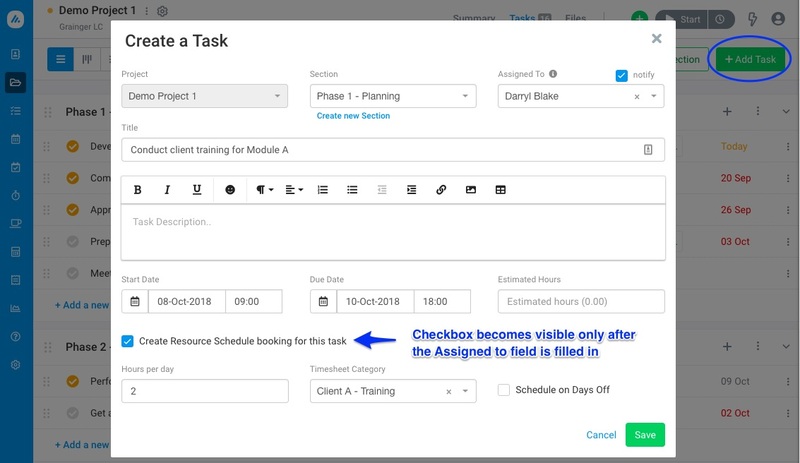 If you use the Resource Scheduling module for capacity planning and resource allocation, you have the option of creating a new task along with a scheduling booking against it directly from the Task Management area. Please note, this option is available only if you click the ‘+Add Task’ button (in a project, My Tasks or All Tasks). 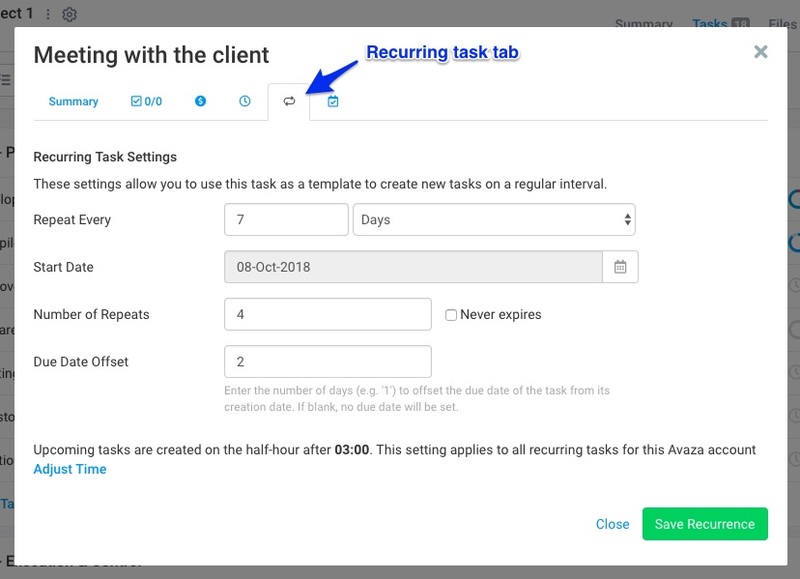 On the ‘Create a Task’ pop-up, once you select a user under the Assigned to field, you will see the option to create a booking against this new task. A new task will be added to the project and you will see a scheduling booking against it on the Team Schedule page as well. Please note the user must have the Scheduling User license in order to create a scheduling booking for them. You can learn more about the Project Task and Resource Scheduling integration here. If a task already exists and you would like to add a new scheduling booking against it via the task management area, you can simply open the task and navigate to the last tab on the task popup. You can click ‘Add a Booking’ to create add one or more scheduling assignments directly from this tab. Next up, we take you through File Management in Avaza. If you need any help with Tasks, feel free to contact our support team via chat or email.